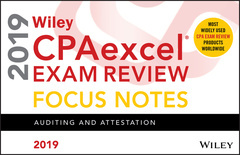 Reinforce key concepts for the AUD section of the CPA Exam with the easy-to-read and carry spiral-bound Wiley CPAexcel Exam Review 2019 Focus Notes: Auditing and Attestation. Learn acronyms and mnemonic devices to help you remember accounting rules, checklists and more. Let the Wiley CPAexcel Exam Review 2019 Focus Notes: Auditing and Attestation help you memorize formulas, concepts, acronyms and more. The Uniform CPA Examination (Exam) protects the public interest by helping to ensure that only qualified individuals become licensed as U.S. Certified Public Accountants (CPAs). Individuals seeking to qualify as CPAs are required to pass the Exam.